When we’re preparing for a mechanical insulation system design project, there are many factors that need to be taken into account. While there may be some similarities between applications, every facility is different and will have different objectives for needing a mechanical insulation system. Here are come considerations, relating to design and general use, that need to be factored into the design process. This is a common design objective for below ambient systems. Controlling condensation with insulation helps prevent dripping, which can cause a hazardous work situation. It also helps minimize mold growth. The goal of the system design is to keep the surface temperature of the mechanical system above the dew-point temperature of the surrounding air. This helps address condensation on the surface of the system as well as intrusion into the system by water vapor. Insulation systems are frequently designed with the intention of reducing energy costs by gaining a return on investment. When an insulation system is being planned, there are several financial factors to consider that will affect the final design. A professional insulation contractor can assist with calculating the estimated energy and cost savings to help with financial planning of a new mechanical insulation system. The defined budget will end up impacting the final scope of work. For example, the thicker the insulation that is required to meet a facility’s objectives, the more the installed cost (labor and material) will increase. So calculating the most economical thickness (the one that minimize total lifecycle cost) is an important part of most insulation planning. Insulation not only helps conserve energy, but it also helps facilities reduce greenhouse gas emissions. Many companies are opting to construct or create green buildings using sustainable building design, and mechanical insulation plays a role in achieving that. When sustainability is a top priority, that must be factored into the design of the system. Mechanical insulation helps reduce far more carbon emissions than it takes to produce the material. This is normally an auxiliary benefit of insulation, but is an important system design objective nonetheless. Insulation helps protect workers from burns and other problems associated with high radiant temperatures. It also has fire resistance properties that make it a common component in designing systems to stop the spread of fire. Even if fire safety is not a specific design objective, it is usually taken into consideration since most mechanical insulation materials generally already meet governmental fire codes. 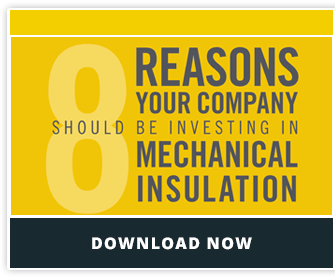 Here are some additional factors that need to be considered during the design process for a new mechanical insulation system. Abuse Resistance: Depending on where the system will be located, it could take a beating from mechanical equipment. Maintenance: Designing the system for easy maintainability is important. This includes creating easy access for inspection and repair/replacement and cleaning. Service Life: Service life factors into the lifecycle cost analysis. The type of environment the insulation will be exposed to (outdoor elements, mechanical abuse, high-traffic areas, etc.) could impact its effectiveness over time if not properly maintained.